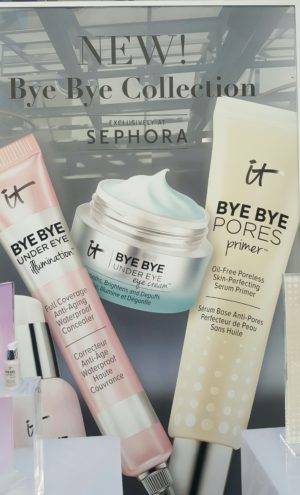 Try These Two Miraculous Products From IT Cosmetics! While I am mostly only using vegan and organic products nowadays, there are some products that I can’t live without outside that realm. One brand that I truly love is IT Cosmetics. miraculous benefits of IT Cosmetics’ two newest skincare launches – Miracle Water and Secret Sauce! Here is the skinny on IT’s newest products and why you will just love them! Developed with plastic surgeons, Miracle Water 3-in-1 Glow Tonic instantly transforms your skin and maximizes the results of your skincare routine! This lightweight no-rinse revolutionary treatment combines your Skin-Brightening Radiance Booster to purify, balance and boost the look of radiance, your potent Anti-Aging Treatment Essence to restore and rejuvenate your skin’s appearance, plus your Skin-Softening Micellar Cleanser to gently attract, trap and remove dirt, oil, impurities and all traces of makeup in one simple step. A skin-brightening radiance booster, an anti-aging treatment essence and a skin-softening micellar cleanser – it delivers a 3 products in one formula. This groundbreaking glow tonic utilizes a complex of 7 key fermented ingredients. Fermented Sugarcane and Fermented Rice work to plump the look of skin, helping to improve bounce and elasticity; Fermented Coconut Water is rich in minerals and amino acids to help provide antimicrobial bene ts; Fermented Sea Kelp, Fermented Green and Black Tea, Fermented White Ginseng and Fermented Pumpkin intensely moisturize, delivering powerful antioxidants and concentrated nutrients to your skin. Miracle WaterTM is also formulated with anti-aging collagen, peptides and hyaluronic acid, plus skin-soothing rose, aloe and chamomile and skin-brightening Drops of Light TechnologyTM Concentrate, diamond powder, vitamin C and licorice root. Also developed by plastic surgeons, Secret Sauce Clinically Advanced Miraculous Anti-Aging Moisturizer instantly hydrates and transforms your skin. Formulated to deliver powerful anti-aging results, visible radiance and immediate skin-smoothing hydration, this revolutionary moisturizer helps you instantly reveal younger- looking skin and experience more miraculous results over time! The skin-loving, powerfully potent secret lies in the Secret SauceTM Fermented Complex: Clinically advanced, penetration-enhancing fermented ingredients that work to increase absorbency and maximize the ultra-hydrating, anti-aging bene ts of Secret SauceTM. Combined with proprietary Drops of Light TechnologyTM in its most concentrated form, plus diamond powder, skin-brightening vitamin C and licorice root, Secret SauceTM gives your skin a lit-from – within glow and reduces the look of discoloration, pores, lines and wrinkles for a soft-focus effect. Paraben-free and perfect for even the most sensitive skin, this miraculous moisturizer utilizes a complex of 7 key fermented ingredients. Fermented Sugarcane and Fermented Rice work to plump the look of skin, helping to improve bounce and elasticity; Fermented Coconut Water is rich in minerals and amino acids to help provide antimicrobial benefits; Fermented Sea Kelp, Fermented Green and Black Tea, Fermented White Ginseng and Fermented Pumpkin intensely moisturize, delivering powerful antioxidants and concentrated nutrients to your skin. Secret SauceTM is also infused with anti-aging collagen, peptides and hyaluronic acid, plus proprietary Drops of Light TechnologyTM Concentrate, diamond powder, vitamin C and licorice root to enhance your skin with natural-looking, flawless radiance. Secret Sauce ($68) and Miracle Water ($38) are now available to purchase at Sephora.com and itcosmetics.com.